← Watch out! They spit! The lotus flower and the papyrus plant, symbols of the Upper and Lower kingdoms. 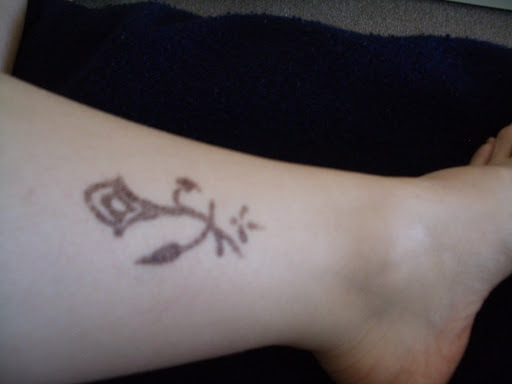 Upper and Lower Egypt, united on my ankle! 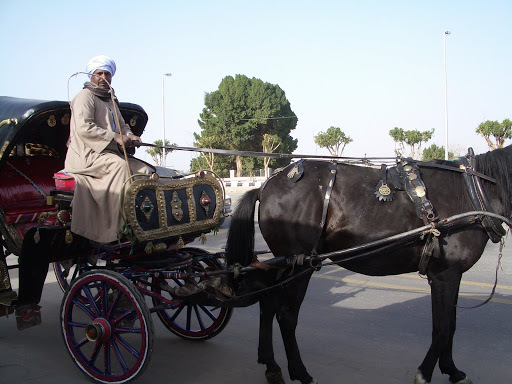 Carriages were our main form of transportation around town while we were in Luxor. You can get a ride across town for only a dollar! 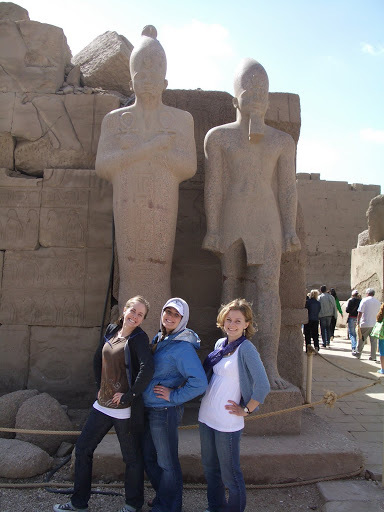 Throughout the Middle Kingdom and the New Kingdom, additions were made to the temple complex at Karnak by many Egyptian pharoahs, including Ramses I, Seti, Ramses II, and Merneptah. At the time of the exodus, Karnak was the center of religious life in Egypt, so in all likelihood, this is where Moses called the plagues down upon Egypt. 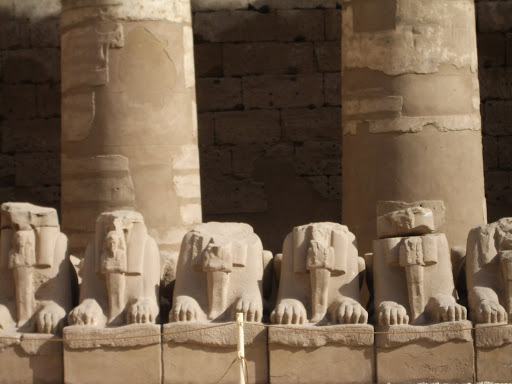 Sphinxes guarding the entrance to the temple (the heads have been removed). 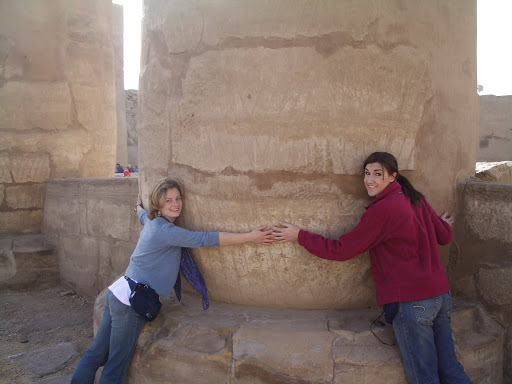 The Karnak temple complex is the largest temple complex in the world (even larger than Temple Square!). The pillars are so big that it takes eleven people to stretch around one of them. They are assembled of many large stones stacked on top of one another. Then they are chiseled to make them look smooth. 1. Lay the bottom stone of each pillar. Fill up sand to the top of the stones. 2. Set the next stone for each pillar on the base stone. Fill up sand to the top of the next stones. 3. Continue stacking on stones and filling up sand until the pillar has reached the desired height. 4. Construct the roof of the temple and decorate the ceiling (you won’t need any ladders or scaffolding to do this, since you’ve filled up sand to the top of the temple). 5. Drain a little sand from the temple and carve the tops of the pillars to make the stacked stones smooth so that each pillar looks like one stone. 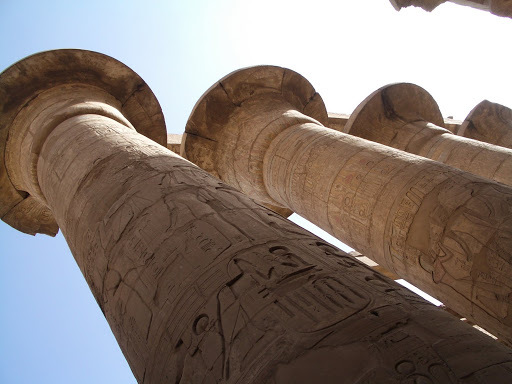 While you’re at it, carve relief images and hieroglyphics into the tops of the pillars, and paint them. 6. Drain some more sand and carve and paint the next section of the pillar. 7. Continue draining sand, then carving the pillars until you reach the bottom. And there you have it! I expect all of you to try it and send me photos of the results. Awesome! I’ll share this with Stephen. We’ve been studying ancient Egypt and Mesopotamia lately. We made an orange slice mummy. He (or it) is still drying out in the salt.